The Pin Jaws are similar to the 1" Jaws but are twice as tall. This allows them to expand in a 1" in diameter hole to hold projects like peppermills. Ideal for projects such as peppermills. They can also be used to hold small dowels. 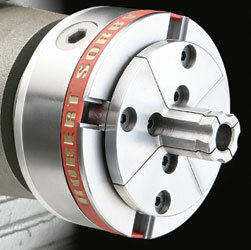 The jaws are shown mounted on the Patriot Chuck, which must be purchased separately.